GUADALUPE, CA. — Single-serve salads are increasingly on the shopping list, and consumers who crave them continually look for tempting new flavors and added convenience. 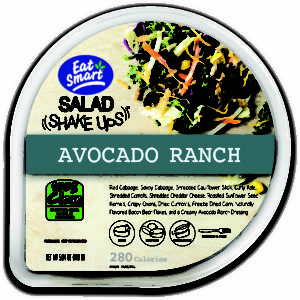 Apio, Inc., a leading producer of fresh-cut vegetables and salads for the United States and Canada under the Eat Smart® brand, is answering the call with its new Salad Shake Ups™ salad bowls. The line’s three initial offerings feature 100% clean label ingredients with no artificial colors, flavors, or preservatives. Each salad’s patented package comes with an interior tray that serves as a lockable lid, making it convenient and easy to mix in the toppings and dressing. “Every Salad Shake Ups™ salad bowl contains at least 10 ingredients, with distinctive and colorful combinations of vegetables, dried fruits, and diverse sources of plant protein that create satisfying flavors and textures,” said Byerly. The Avocado Ranch single-serve salad bowl is a crunchy blend of red cabbage, Savoy cabbage, shredded cauliflower stalk, curly kale, shredded carrots, and freeze dried corn. It also contains shredded cheddar cheese, roasted sunflower seed kernels, crispy onion pieces, dried currants, naturally flavored bacon bean flakes, and a creamy avocado ranch dressing that complements the ingredients. The Tropical Lime salad bowl has a tasty blend of vegetables and dried fruits — green cabbage, broccoli stalk, Napa cabbage, curly kale, and Italian kale along with dried pineapple, dried mango, and dried papaya. White sesame seeds, crispy quinoa, roasted red quinoa, and thin crunchy noodles with a creamy coconut lime chili dressing complete the kit to deliver a mouth-watering flavor experience. The Raspberry Acai salad bowl blends broccoli stalk, green cabbage, curly kale, radicchio, dried cranberries, and dried blueberries with sliced toasted almonds and three nutritious varieties of seeds (hemp, flax, and chia). The tangy raspberry acai dressing tops it off perfectly. Apio has been recognized for its inventive packaging, and the Salad Shake Ups™ continue the company’s tradition of innovation. “We were delighted to be awarded the inaugural packaging Innovation award at CPMA (Canadian Produce Marketing Association) on May 10, 2017. This newly created award recognizes excellence in packaging designed to answer consumer needs and to maximize the sales of fresh produce.” said Byerly. Each bowl has a unique leaf-shaped, film-sealed top. “When consumers pull back the top, they find a tray with packets of toppings and a fork,” explained Byerly. “They remove the tray to reveal the salad blend, then pour the toppings and the dressing onto the vegetables. Next, they flip over the tray, snap it onto the bowl, shake to mix the ingredients, and then unsnap the lid and eat the salad with the fork. Easy mixing, and no mess – it couldn’t be more convenient! The introduction of Salad Shake Ups™ — with their 100% clean ingredients — is timely given the accelerating clean food movement, sparked by health-conscious consumers who want to know what is and isn’t in the food they eat. Estimated North American sales of clean label products in 2015 were $62 billion1, and 62% of consumers globally say they try to avoid artificial preservatives, flavors, and colors in their food2. Eat Smart is the first brand in the non-organic salad kit and tray category to commit to clean ingredients and labeling, with plans for all products to contain a 100% Clean Label by the end of 2018. All Eat Smart products will be free from high fructose corn syrup, artificial preservatives, hydrogenated fats, as well as artificial colors, flavors, and sweeteners. The 5-ounce Salad Shake Ups™ will be available in both the U.S. and Canada and have a suggested retail price of $3.99 in the U.S. and $4.99 in Canada. Apio, Inc., was founded in 1979 by five growers of celery in the Santa Maria Valley on the central coast of California. Today the company is the leader in processing and marketing fresh-cut specialty vegetables in the United States and Canada. Headquartered in Guadalupe, California, Apio sells its specialty vegetables, salads and party tray products under its retail Eat Smart® brand and foodservice GreenLine® brand. Landec Corporation (NASDAQ: LNDC), a leading developer and marketer of innovative and proprietary products for healthy living applications in the food and biomedical markets based in Menlo Park, California, acquired Apio in 1999. See www.eatsmart.net for more information.